The Archaeologist: In a World First, the True Spirit of Harley Davidson is Embodied in Drinkable Form. Serviceplan Group Develop Creative Concept with Renowned Hamburg Designers "Studio Oeding"
Lovers of iconic Harley Davidson motorbikes from all over the globe make a pilgrimage to the workshop of Ehinger Kraftrad, an internationally renowned manufacturer of custom-made motorbikes. 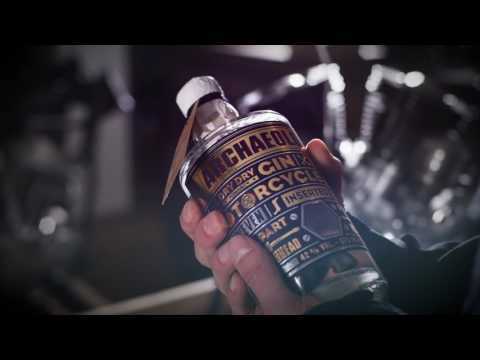 Kraftrad has taken his obsession to another level, with the creation of 'The Archaeologist', a Premium Dry Gin whose bottles have the unusual feature of containing original Harley engine parts. HAMBURG, Germany, July 25, 2017 /PRNewswire/ -- For decades, Uwe Ehinger, founder and namesake of the world's first Premium Dry Gin to contain Harley Davidson engine parts, has been searching the most remote places on the planet for antique motorbikes, and saving them for dealing or as core pieces for designing his own models. This earned him the nickname ˮThe Archaeologist". ˮEverything I do pays tribute to the things that used to be", Ehinger explains about his work. Now he honours some of the greatest legends in motorcycle history with a special homage in liquid form: ˮThe Archaeologist". "The Archaeologist" is a Premium Dry Gin – and the first spirit of its kind. 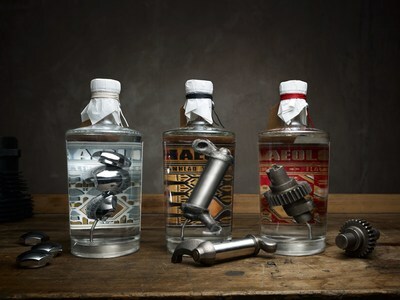 Thus, it's filled in bottles together with original engine parts of legendary Harley Davidson bikes Ehinger has discovered someplace over the world: 1939 Flathead camshafts from the Mexican desert, 1947 Knucklehead screw-nuts from Chile or 1962 Panhead rocker arms from South Korea. To each of these iconic machines, Ehinger dedicates a very own sort of tribute Gin. As an analogy to Ehinger's motorcycles, ˮThe Archaeologist" is pure craftsmanship: The parts of the motorbikes are specially cleansed and sealed with a tin alloy to make it safe for them to be utilized in a drink. Subsequently, they are soldered onto a steel structure and encased by a handcrafted bottle. The creative concept was developed by Serviceplan Group together with renowned Hamburg designers "Studio Oeding". The entire look and feel recreates the original packing of the antique engine parts – using authentic materials and historic techniques. Packages are made using selected cardboards and colours, printed on an original Heidelberg Tiegel printing press from 1931. Waxed wrapping paper tells the story of each discovery. This unique design is completed by hand-stamped, tamper-proof seals and clenched hang-tags, each bearing the unique serial number of the engine part in its respective bottle. Every single bottle of ˮThe Archaeologist" is a unique item and therefore as irretrievable as the era of the motorcycles it represents. Preserved for eternity – or at least for a very special night amongst motorbike enthusiasts. The first edition of ˮThe Archaeologist" is reserved for Ehinger's most loyal customers and is only served in Ehinger's garage. A limited number were distributed via the website's online shop and sold out within hours. Advance orders for the next series can be placed from now on.